Hi, friends! 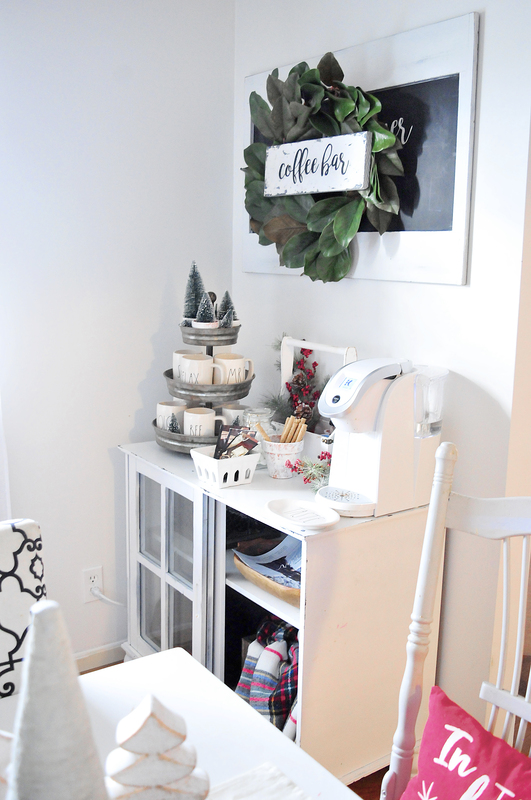 Today, I’m really excited to be sharing one of my favorite areas of the house: my dining room — specifically, my coffee and cocoa bar. I love hospitality so very much. Having a full house of people just makes my extroverted heart happy, and one of the main ways I know to welcome folks in is to offer a drink. When it’s as cold outside as it is today, a warm drink is the way to go, and y’all know how much I love coffee! 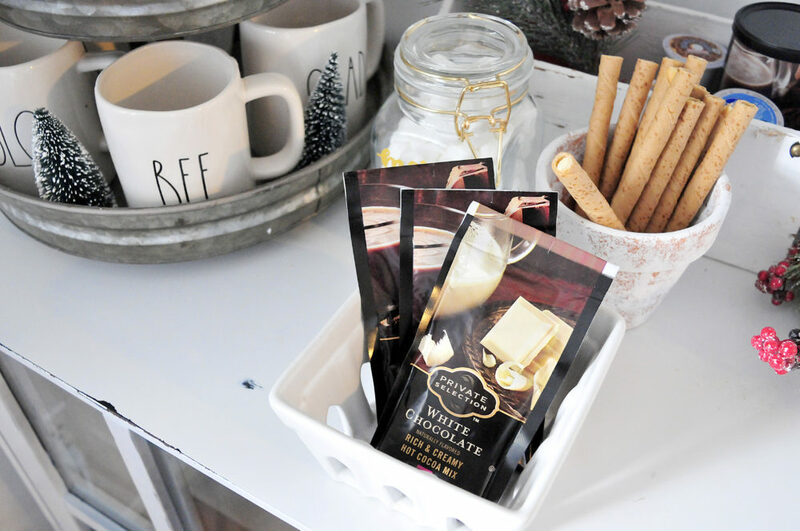 My little one loves hot cocoa, especially the little marshmallows, so naturally I had to include it in my hot bar for this year’s holiday festivities! I like to keep it simple, friends. I don’t go the whole peppermint, whipped cream, chocolate spoon route. 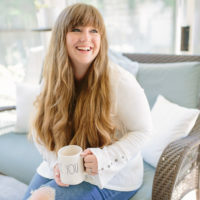 Give me some Pirouette french vanilla sticks and little marshmallows, and I’m a happy girl! 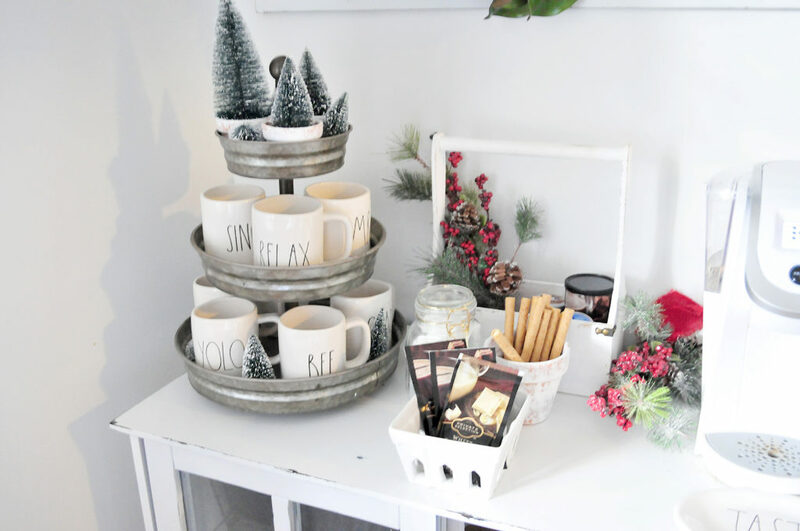 So this hot cocoa bar isn’t terribly difficult to pull off. Yay! 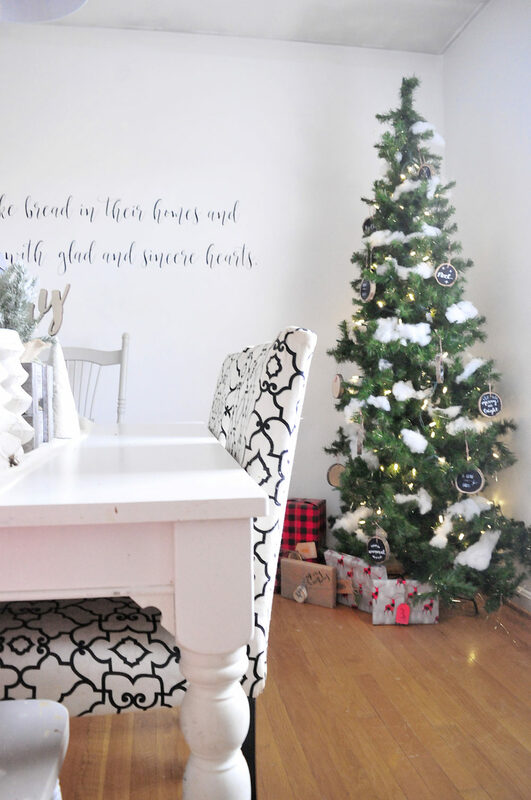 It’s also really easy to break down and change out once the holidays are over (but let’s not talk about that right now because I am still well into the holiday spirit!). I also have to brag on the Target dollar spot because of all the goodies I snagged there last year that have come so in handy this year! After Christmas, if you don’t know this already, all of the Christmas items in the dollar spot (which are like $1 to $5) get marked down a ridiculous amount! The garland for my tree, the red pillow, the tiny pumpkins, the table runner and the merry cutout are all from the dollar spot. Yes, please! Our house, you probably know if you’re familiar to SLB, is a constant work in progress and absolutely full of DIYs. Rarely do I purchase something outright. I’m a Craigslist, thrift store, antique shop, yard sale kind of girl. Also, I run on a super tight budget when it comes to home stuff, so… maybe I’m forced to be that kind of girl. At any rate, it’s the truth, so I’ll do my best to share where things are from/how I made them 🙂 The good news is if I DIY-ed it, there’s probably a tutorial! Looking particularly at the bar, the cabinet the entire coffee bar is on was a piece of furniture from Kroger that I upgraded with some new legs and a coat of paint plus some distressing. You can find the full tutorial here! 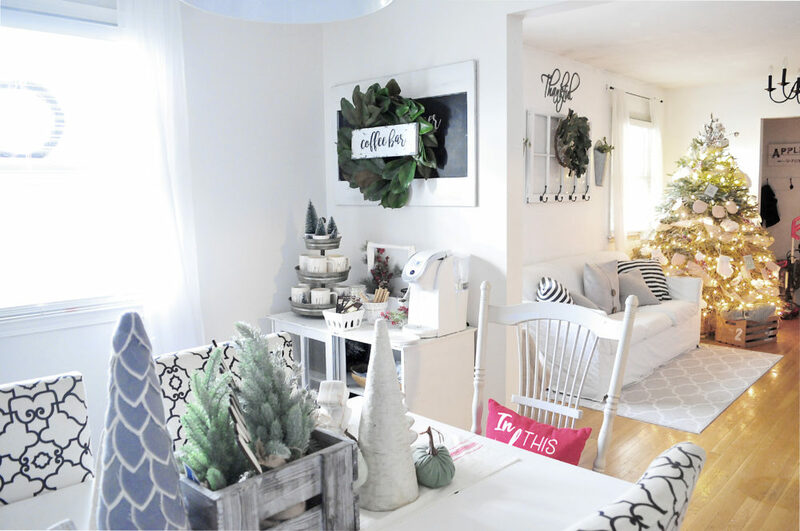 While we’re at it, I recently went crazy with some white paint to upgrade the dining and living rooms (and the hallway and eventually basically the whole house probably). Here‘s how that all looked before and after. If you can’t tell, I’m a huge fan of greens at Christmastime. A few pops of red complete the Christmas look, but neutrals are my jam with the dark contrast of black. A modern farmhouse meets industrial sort of look. 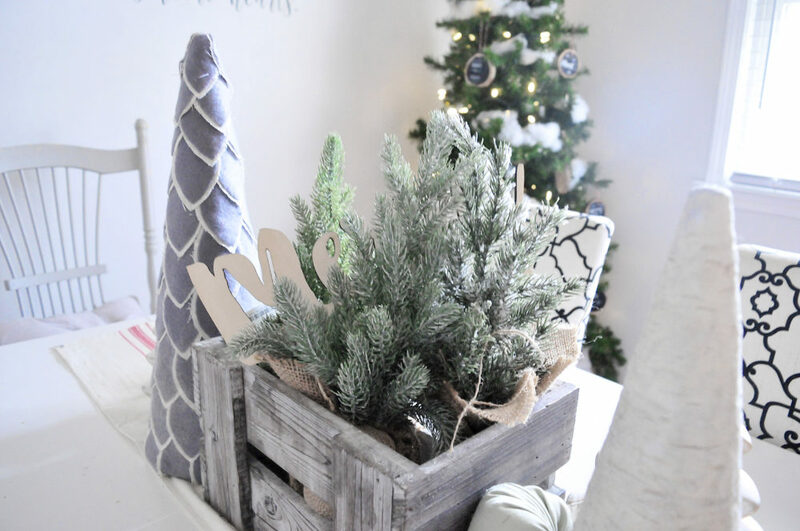 I found these little bottle brush trees at Hobby Lobby this year along with a few greenery picks from Walmart with some holly berries. 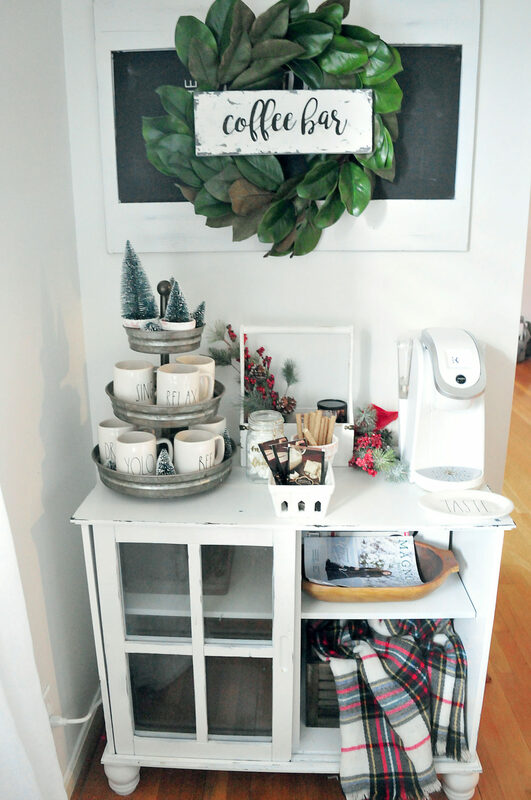 That and a blanket scarf and handmade “Joy” sign are all I used to change my coffee bar from everyday to holiday! So simple! My sweet mother-in-law gave us the tree in the corner. I have no idea where it came from, but the lights still work on it and that makes me happy! 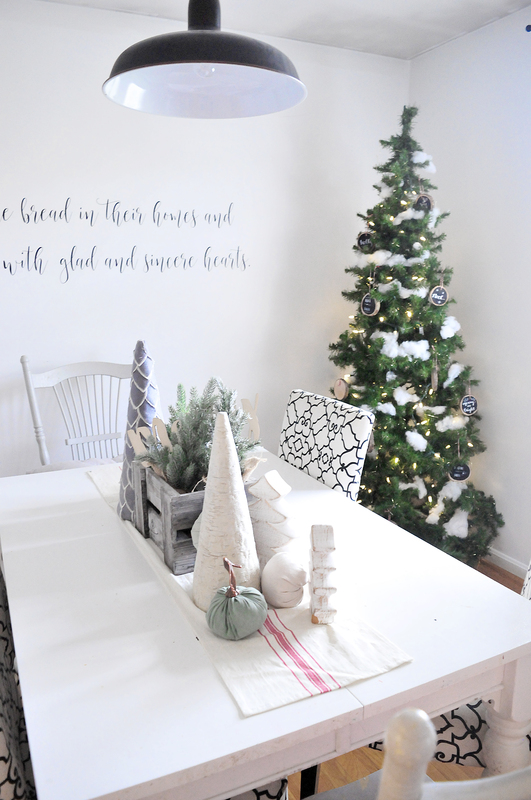 Last year, we did a workshop where we made wood slice ornaments, so the only decor on this tree is some “snow” which is actually batting and those ornaments plus some gifts under the tree. Like I said, simple! On top of the bar, I have an array of things I’ve either made or purchased on sale. The berry bowl holding the hot cocoa packets is from Kroger. They had them on clearance last summer, and I couldn’t resist one! 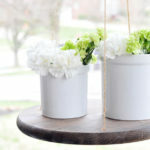 The clay pot holding the Pirouette sticks is a DIY, and an easy one at that! 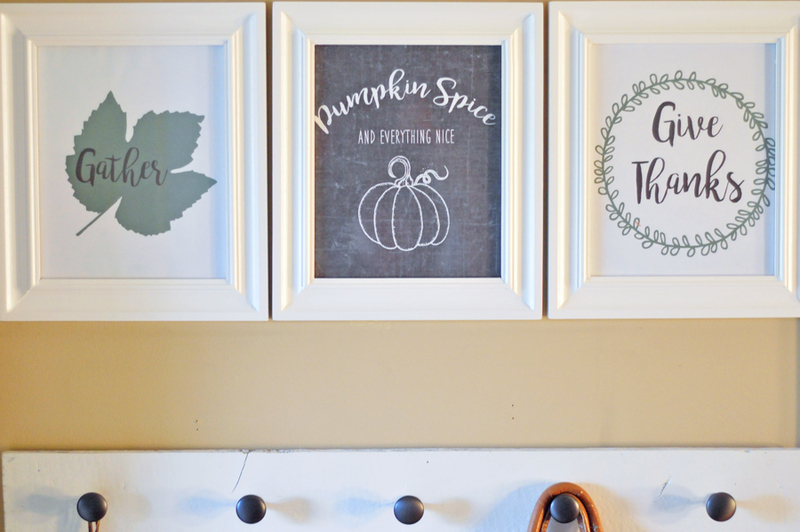 A clay pot, a paper towel and some white chalk paint are all it take to make this yourself. Just dab on the paint with the paper towel until you’ve covered all you want and voila! I found the little canister with gold hardware at Walmart this year. I didn’t get a good photo, but Merry & Bright is written in gold foil on the front. Who can say no to that!?! Of course, I made the coffee bar sign hanging on the chalkboard. Something similar is available my booth inside The Amsden and will be available online after Christmas. 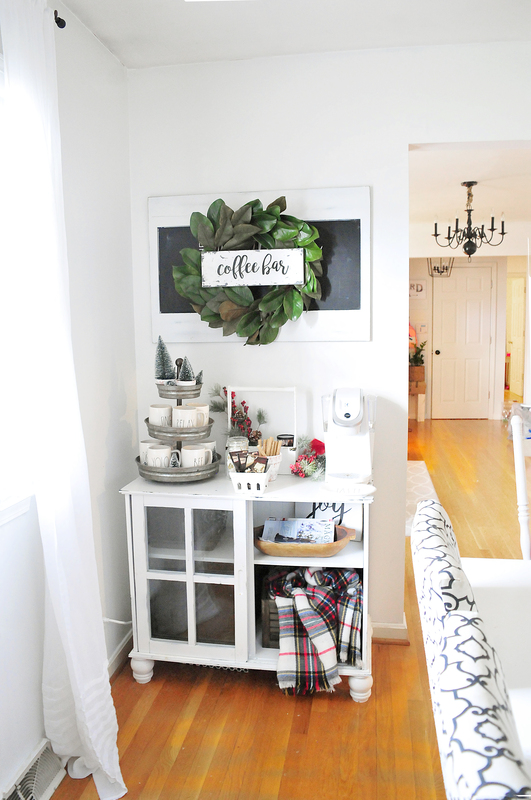 The chalkboard is a Hobby Lobby find that I spray painted, and the wreath is also from Hobby Lobby. 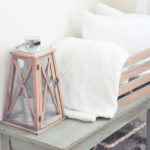 The pretty little trench bowl inside the cabinet is one of my favorite finds from The Faded Farmhouse in Columbia, TN. If you’re ever in the area, go check them out! Oh, and you can shop online!!! There you have it, friends! 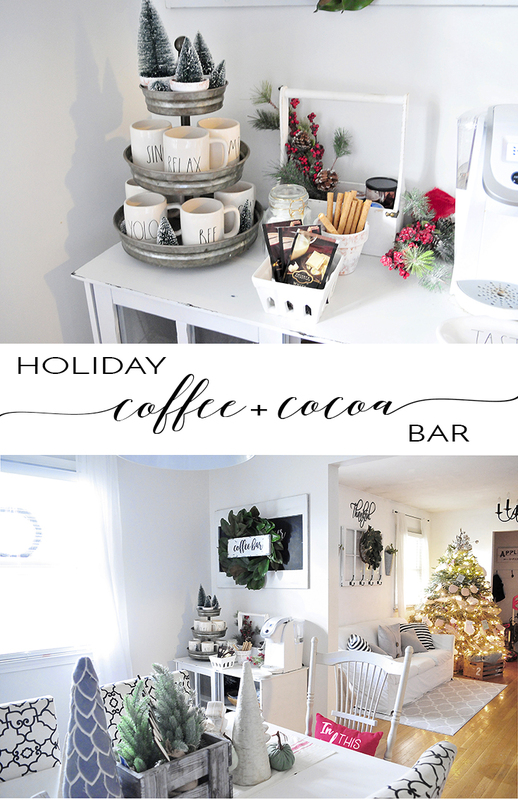 My holiday coffee + cocoa bar. I can’t wait to host our next get together so friends and family can enjoy this bar as much as we do! What’s your preference? Coffee or cocoa? 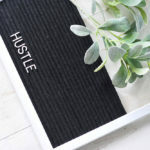 If you’re looking for some design help for your own space, please give the folks at Havenly a look! 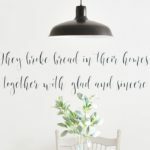 Their online interior designers are super talented and would be more than happy to help you design the space of your dreams. Have a great week, friends!